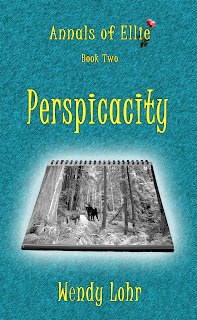 Wendy Lohr: Perspicacity Has A Synopsis! Great things are afoot and one of those is that Perspicacity (Annals of Ellie #2) has a synopsis! I'll be sharing that and the cover below momentarily. Events from the past, secrets from the future, all mix to confuse and confound. Hormones and naiveness plague Ellie as she navigates her special talent and her new world of college, foretelling, and sleuthing. Add her out-of-control roommate and adventure is sure to follow. Normalcy is always in question and perspicacity is all she has. Or does it have her?